I never dreamed I would go on a cruise. I like an active vacation and thought I would be bored on a cruise ship. However, our Disney Dream cruises provided us more activities and fun than I ever imagined. 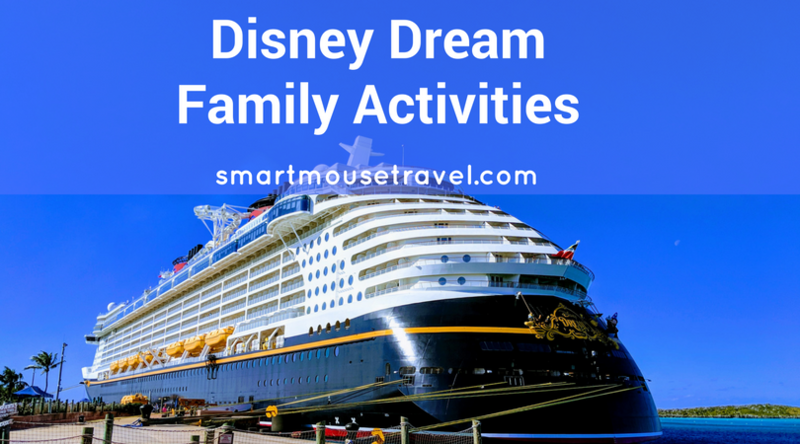 There are so many Disney Dream family activities it is impossible to do them all (if you plan on sleeping). 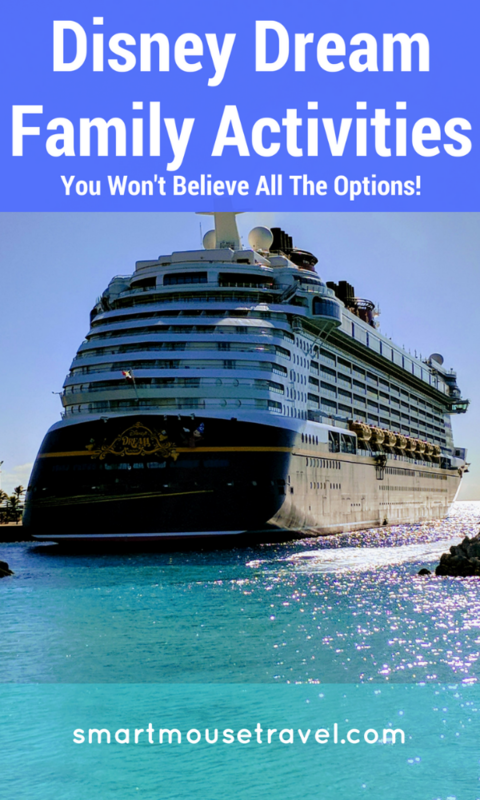 Here is a comprehensive list all of the options that were available on our Disney Cruises and specific tips for the ones we did. 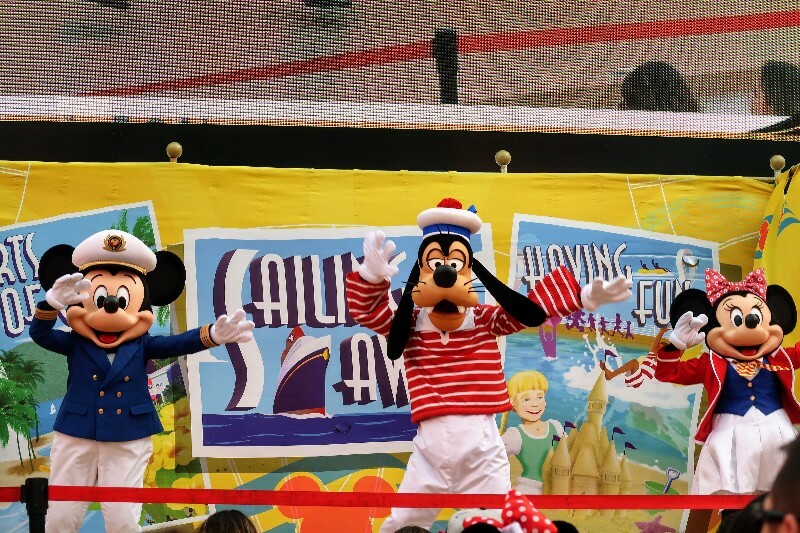 The Sail Away Party is one of the very first events on your Disney cruise. 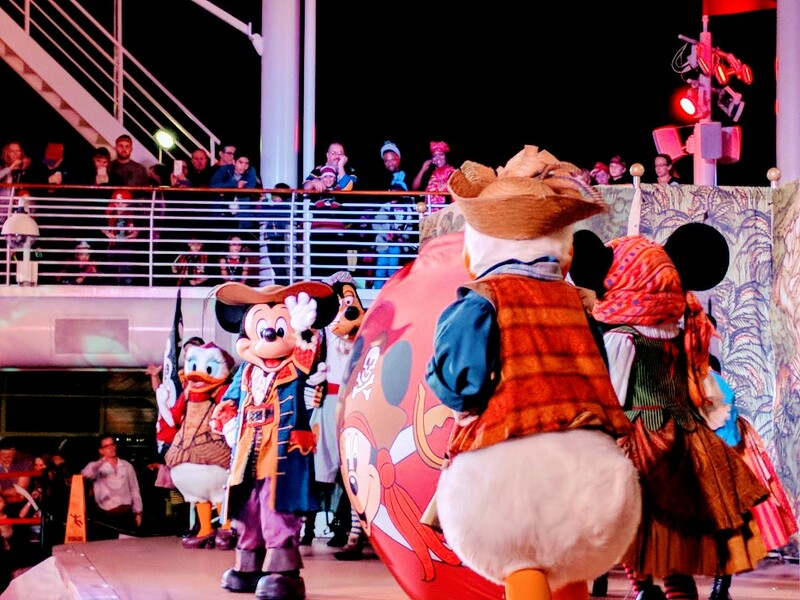 Just before the ship leaves the dock, Mickey and friends put on a welcome show. The sail away party gets everyone excited about the trip ahead! Starting in the afternoon on Pirate Night the Bibbidi Bobbidi Boutique is transformed into the Pirates League. This allows your budding pirate to be transformed into a true scalawag. The Pirate League is for girls and boys ages 3 years and older with no upper age limit. The boys can choose from 3 different make up options with varying guy-liner and facial hair. 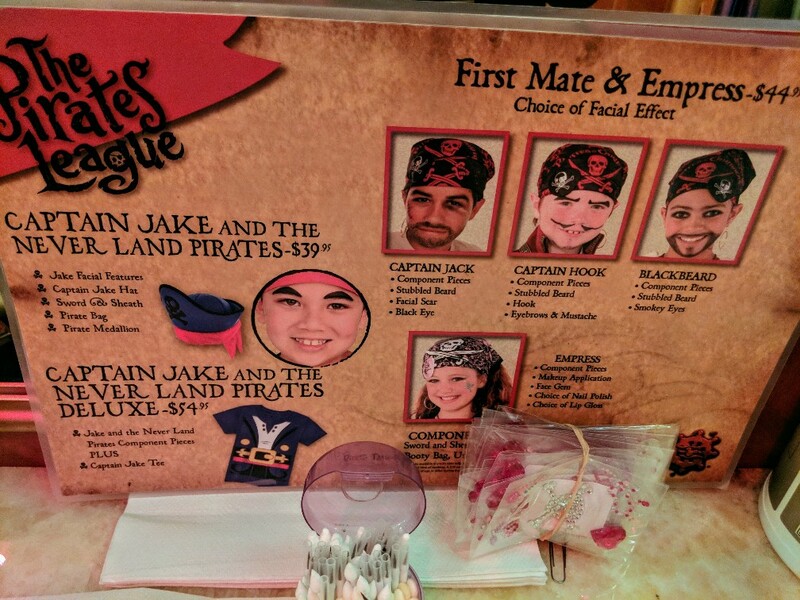 Girls have one pirate princess option. Some packages are makeup and accessories only; others add a costume for an additional charge. We already had super cute pirate costumes for Elizabeth, so she opted for just makeup and accessories each trip. 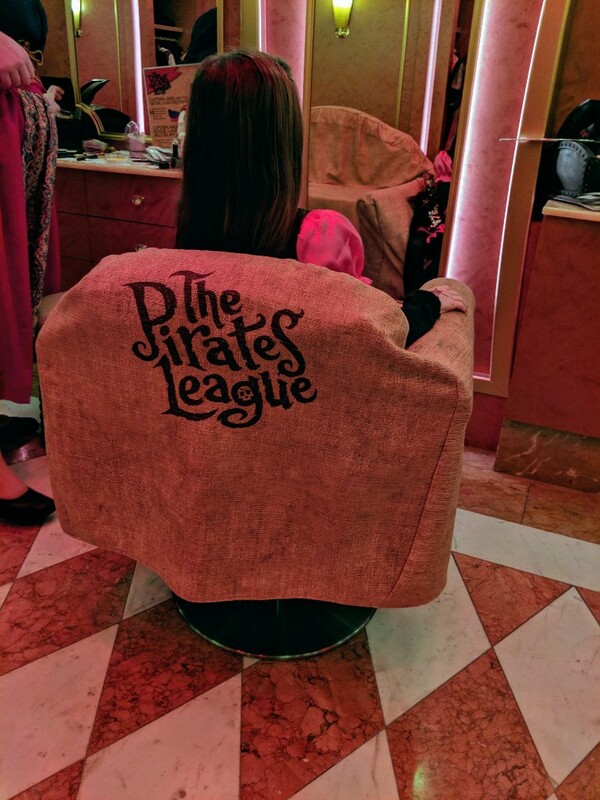 This pirate makeover is one of Elizabeth’s favorite things about our Bahamian Disney Cruises! Pirate night occurs one night during cruises in the Caribbean (get it… Pirates in the Caribbean?!). Pirate Night is an event people really get into. Adults and kids are allowed to dress up in their best pirate attire, and we saw several large families decked out. Each person in your stateroom will receive a Mickey pirate bandana for optional use for the night’s activities. Elizabeth dressed up and did Pirates League while I opted for a more pirate inspired look than true costume. There are two different pirate stage shows on Pirate night. Pirates In The Carribean is the first show of Pirate Night. It features Mickey training his new crew (you) in pirate etiquette. Captain Hook and Smee try to take control of the ship, but Mickey prevails. The second show features Captain Jack Sparrow and some other fun pirates sharing silly songs. Fireworks are set off over the ocean in this event that takes place after the second pirate show. We skipped the fireworks the first time, but made sure to see them this time. The fireworks over the ocean were beautiful and I’m glad we stayed up to see them. After the Buccaneer Blast Fireworks a DJ plays family friendly dance music in front of the Funnel Vision stage. Dancing and having fun at Club Pirate was a nice way to finish off our night. If dancing works up your appetite then head to Cabanas for a late night pirate buffet. I thought the kids clubs were for the kids only throughout the cruise. However, there are various times that the Oceaneer Club is available for family open house. This allows you to enter the kids club and enjoy the activities with them. During the open house we were able to watch Elizabeth participate in Jedi Training: Experience the Force. This cool interactive show has an enthusiastic Jedi wannabe who meets a real Jedi. 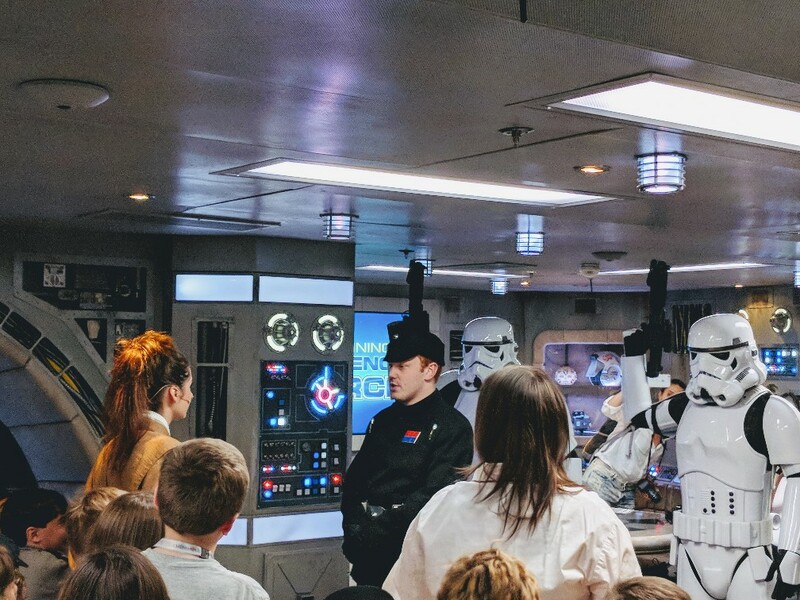 I won’t ruin the show with all the details, but expect the kids to move some items around and Storm Troopers to arrive during the show. It was a lot fun to watch (since we grownups were not allowed to participate). During the Oceaneer Club open house we also got to play Disney Infinity on Xbox in one area, do crafts in Pixie Hollow, and check out our favorite toys from Toy Story in Andy’s room. If you have younger kids, It’s A Small World Nursery is a nursery/kids club for guests age 6 months to under 3 years old. Read more about it and get other great advice for taking a baby on a Disney cruise at Tear Free Travel. There are characters all around your cruise ship. You can find when and where each character will meet in the daily Personal Navigator or on the Navigator App. Find out more about meeting characters on your Disney Cruise in this article. Most of the character meet and greets operate like they do in the parks. You line up for the character, and a cast member closes the line when it reaches its maximum length. There are some character meet and greet options that you book ahead of time. This scheduling of tickets for character meetings occurs online when you register for excursions and online check in. Tickets are free, but limited, so I recommend you obtain them right when the check in window opens. 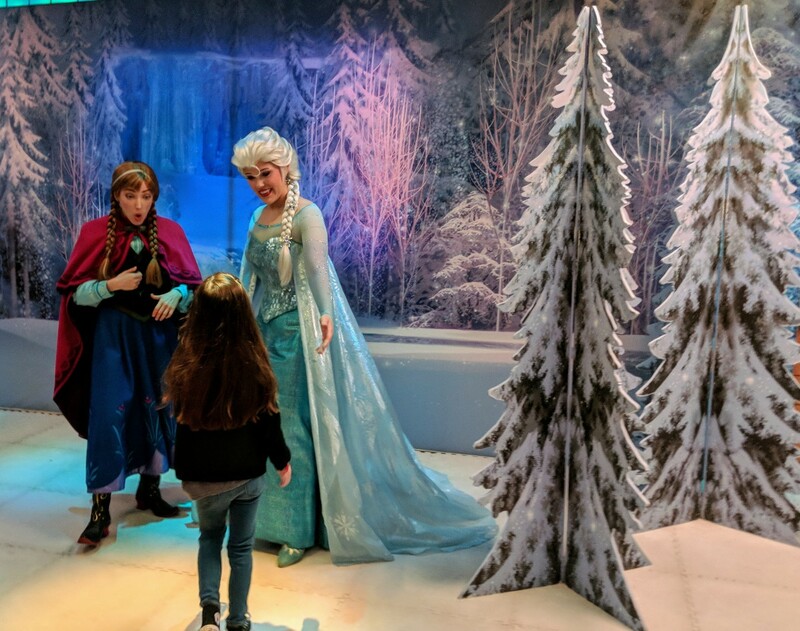 The two ticketed options on our cruises were Princess Gathering and Frozen Gathering. The Princess Gathering ticket allowed us to meet Rapunzel, Tiana, Belle, and Cinderella in about 15-20 minutes. The Frozen Gathering ticket allowed us to meet Elsa and Anna in front of a winter scene, but this line took a little longer. The Midship Detective Agency is run by Mickey, Donald, and Goofy, but they need your help to solve a case. You can choose from 3 different cases with varying difficulty. 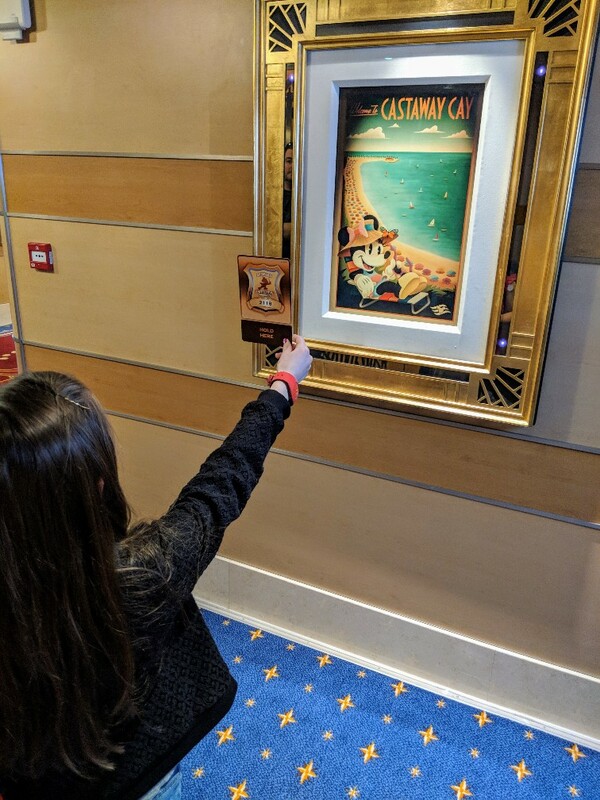 Once you register your badge (which has a QR code on the back) you use a map to find the special interactive paintings around the ship. Each painting will have a different video or sometimes a task you need to complete with your badge. Once you have gathered enough clues you execute a search warrant based on your guess of the villain responsible for the crime. You watch as the villain’s room is searched, and then if you are right the case is solved. If you guess wrong you can guess again! It took us about 45 minutes to complete a case, and we thought the game was really fun. Each of the Disney Cruise Line boats has a movie theater on board. This theater shows current releases at no additional charge. It seems that generally the 3 newest released Disney movies are available on board. Each Disney ship has its own live shows that are performed nightly at no additional charge. Generally there are two times for a show each night. Having two showtimes allows people with main or second dining to see a performance. On the Disney Dream is the new Beauty and the Beast musical. This show uses creative set pieces, live actors, and technology to retell the story from the 2017 live action movie. I was extremely impressed with the performances and so glad we saw this recently unveiled show while on our cruise. On the Disney Dream there are many ways to play in the water. You have your choice of Donald’s Pool, Mickey’s Pool, Funnel Puddle, Nemo’s Reef, and Mickey’s Slide (in addition to the AquaDuck). I was a little surprised that the pools were on the small side, but having two made this better. There were tons of deck chairs both around the family pools and on the upper deck where you could hang out and enjoy some sun. Pro tip: Wear your swim suit under your clothing on embarking day and pack any pool gear you need. This way you can swim or play on the slides even though your room may not be ready yet. There is live music in the lobby atrium most evenings. We’ve seen a variety of musicians play and they have all been amazing. It is great fun to see people of all ages hanging around the atrium or dancing to the music. We even saw Pluto come out and dance a couple of times with guests. 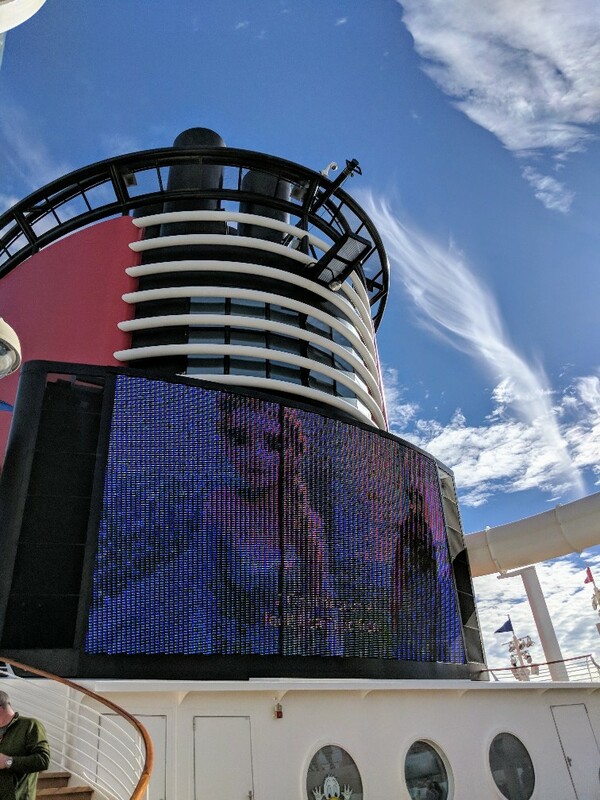 One of the funnels of the Disney Dream has a huge screen that is used during deck parties like the Sail Away Party and Pirate Night to show what is occurring on-stage. When it is not being used for these events it plays older Disney movies. This allows you to watch some of your favorites while hanging out in the pool area. 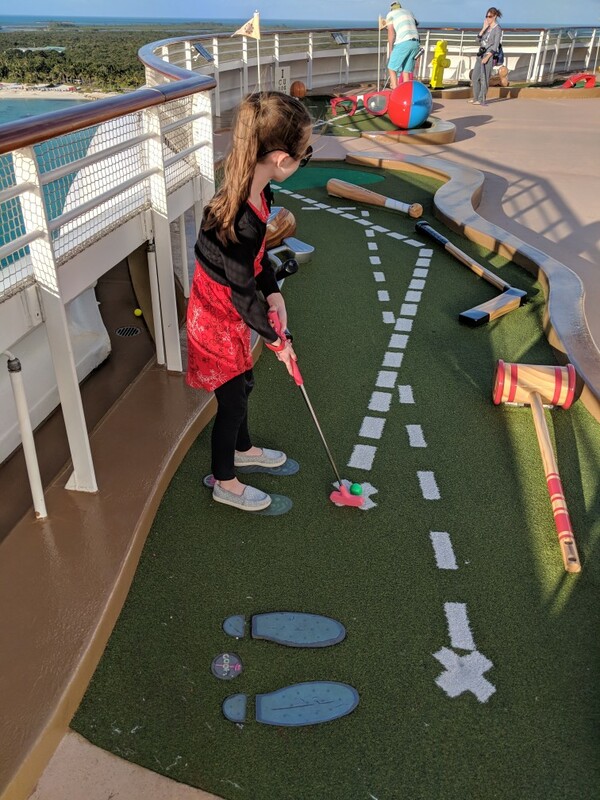 This 9-hole miniature golf course is found on Deck 13 aft on the Disney Dream. You just find the first hole, help yourself to a club and ball then play as many rounds of miniature golf as you please. Not surprisingly, Goofy Golf holes were pretty silly and increased in difficulty as you went along the course. This was a great way to fill in what little free time we had one night before dinner. 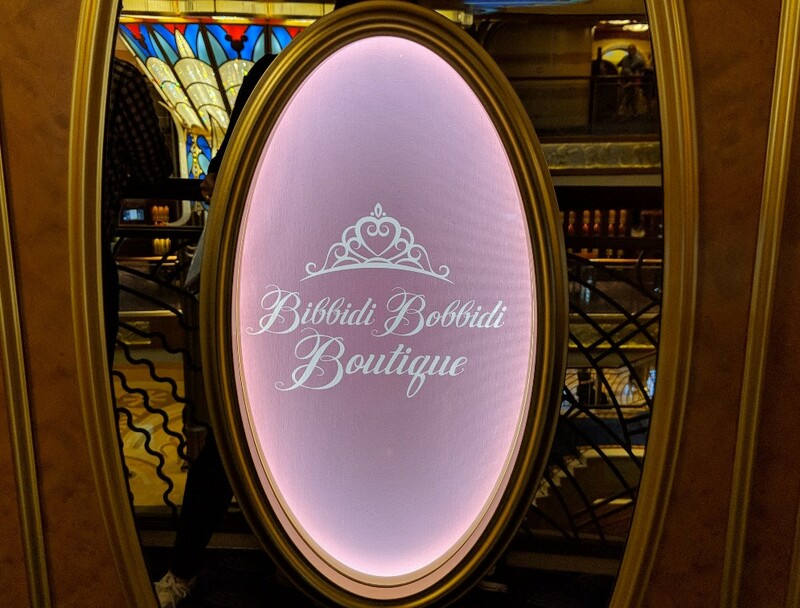 Your little princess can get the royal treatment at the on ship Bibbidi Bobbidi Boutique. Again there are several packages available some with hair and makeup or others that also include a costume. Please note: When Elizabeth had makeovers at Bibbidi Bobbidi Boutique in the Disney Parks we always brought our own costume from home. This huge water slide, sometimes called a water coaster, winds its way around the Disney Dream and her sister ship Disney Fantasy. No matter if the weather is warm or cool there is almost always a line for this fun ride. You must be 42 inches (107 cm) tall and be 7 years or older to ride with another person. To ride alone you must be 54 inches (138 cm) or taller. Several family crafting activities were offered while on our cruise, including make-your-own door hangers. It was on my list, but we didn’t end up having a chance to make it. I did see other people’s finished products, and they were pretty cute. This 5K occurs the morning you dock at Castaway Cay. The course takes you around Disney’s private island and gives you a great overview of the property (in addition to some good exercise). You are awarded a Castaway Cay 5K finisher’s “medal” for completing the event, which although plastic is still pretty awesome. You must sign up to participate once you are on board, not online. Certain lounges are family friendly on the ship. At different times during your cruise there are opportunities to attend a family dance party or go sing karaoke. These lounges also host trivia and game shows. For example, during our cruises there was a family Disney Trivia game as well as the So You Think You Know Your Family? game. Found indoor near Goofy Golf are two sport simulator games. You can choose from golf, baseball, basketball, foootball, hockey, or soccer. Please note: These simulators on Goofy’s Sports Deck are one of the rare extra cost items. Reservations are also recommended. As crazily long as this list is, I know I will have forgotten some family friendly activity on our Disney cruise. There are also tween-, teen-, and adult-only activities that I didn’t even include here. That goes to show how many amazing things there are to do on your Disney cruise. 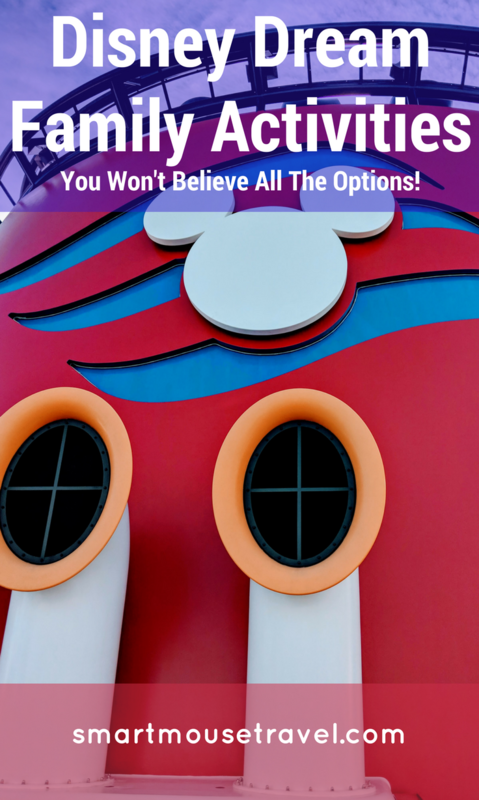 Some of these options are specific to our ship, the Disney Dream, but each of the 4 Disney Cruise Line ships have special offerings that are similar. Have I, a former cruise skeptic, convinced you to try a Disney cruise yet? Make sure you check this comprehensive guide from VeraVise Travel to learn more about planning a Disney Cruise. If not, what is holding you back? I really do have to admit that I was wrong and now we are huge Disney Cruise fans. Are you curious what a Disney Cruise Line stateroom really looks like? Find our complete stateroom review here. I cant wait to cruise again! All the ships are chock full of activities (My favorite being sitting by the pool or watching the endless horizon) obviously disney is so family oriented. sounds awesome! great tip about the workout gear!